£80 Refundable Security deposit required for covering breakages paid with deposit.£50 deposit for holidays. 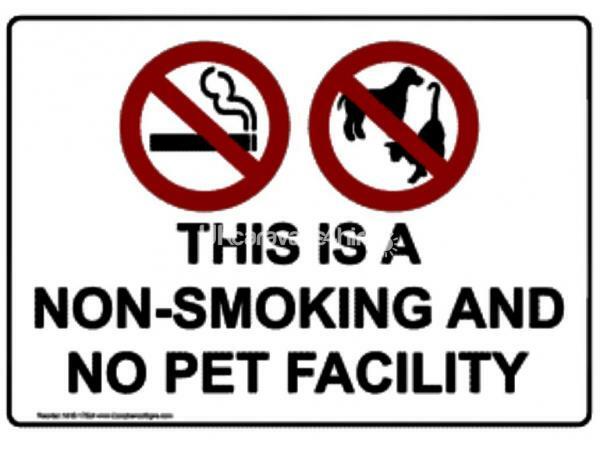 NB No smoking or pets allowed due to family allergies. Our brand new 2018 Swift Bordeaux provides you with a luxury family holiday home, right here on Penally Court. 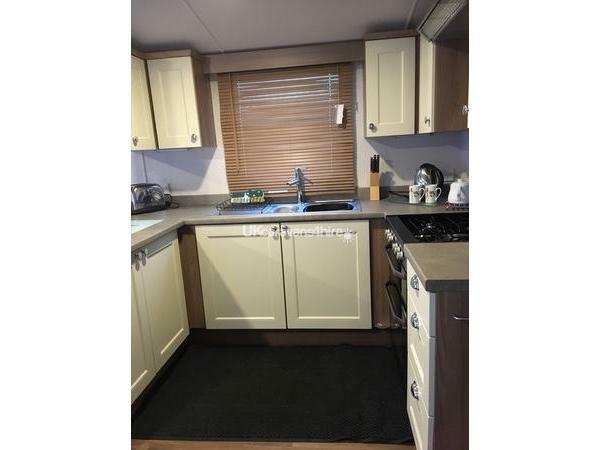 It comprises a luxurious spacious living and dining area along with a fully fitted kitchen, complete with fridge/freezer, microwave and plenty of storage space. We have a fantastic view of Tenby in the day from the front window it is superb view at night. 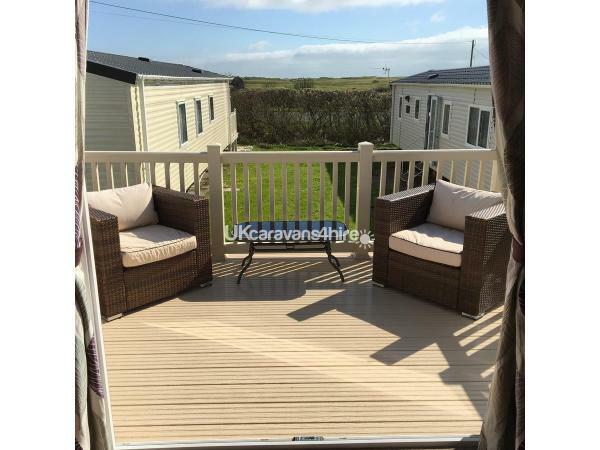 We have a two Decking areas, we have provide brand new Rattan Furniture for our guests use. Separate to the living area are the bedrooms and bathroom. The main bedroom has a king size bed, on suite WC, fitted wardrobes and vanity area. The twin bedroom has plenty of storage space and wardrobes for use. The bathroom has a large modern shower cubicle with thermostatic power shower. 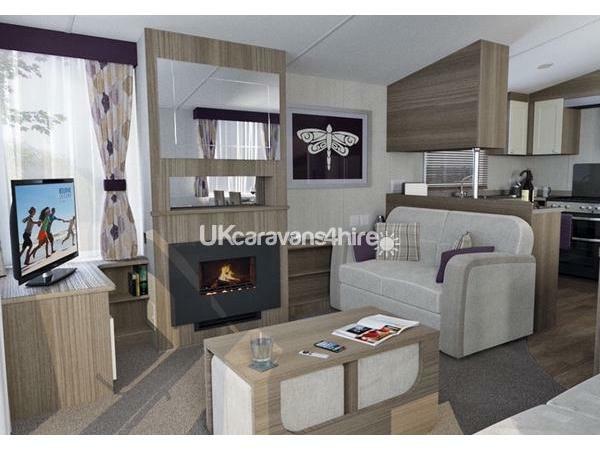 Our brand new caravan has a king size bed and double glazing, central heating, luxury carpet, plush furnishings, Digital TV and thermal performance insulation along with a brand new 18ft decking area with brand new luxury furniture, helping you relax after a busy day/night to enjoy. We have a large Paved area with garden benches for your enjoyment and use. One bench is available for your beach wear bucket and spades. 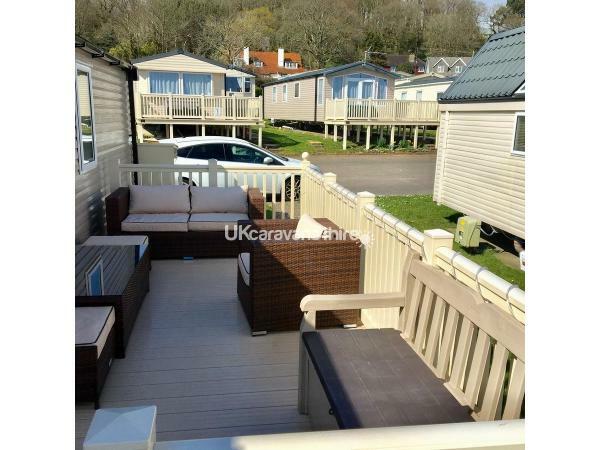 The caravan looks out to the left you can see Tenby in the night this is very attractive to see, we have hedges in front and many little bird can be seen,There is also a parking available behind the caravan on the main road. All amenities at Penally Court requires an entertainment pass at a cost, this can be purchased at Kiln Park in reception or through us prior to your holiday. Penally Court is a unique site, providing you with the "best of both worlds". At Penally Court you will find a quiet yet respected site with outdoor heated pool, children's park, playing field, launderette, lounge with pool table, dart board and other games. Allowing you to have the peace and tranquillity required for a well-earned holiday. 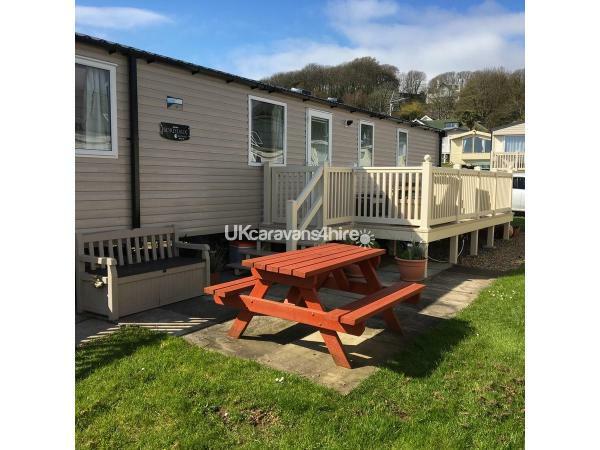 Our caravan is situated within the beautiful surroundings of the West Welsh Coast, which is just a short walk from the caravan. On the other hand, if you want to get involved with the holiday activities and entertainment that are available at Kiln Park's main site then you are able to do so (entertainment passes required). A shuttle service is available between parks (2 mins drive) up to complex close which is approximately midnight. There are local amenities available immediately such as a train station, public house, restaurant, service station and a small shop in Penally village. However, Tenby hosts a larger scope of amenities and is only a few minutes? drive away. If you enjoy walking then, Tenby is just a short distance east, along the beach. With Manor bier to the west, along the coastal path. 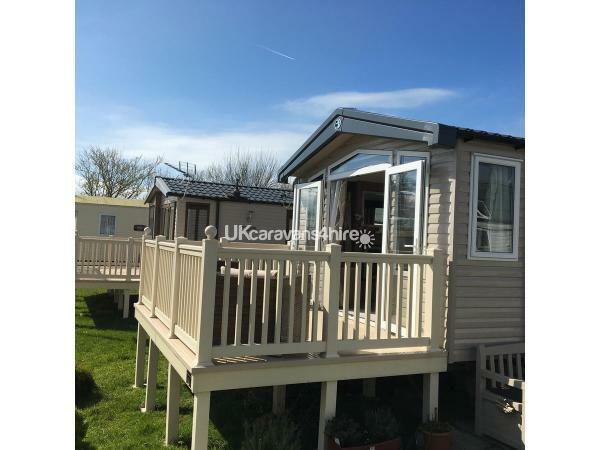 If you want to visit attractions such as Oakwood Park, Folly Farm, Pembroke castle etc then our caravan is ideally situated to visit, as they are within a 20-30 minute drive, along with many more. Our caravan is non-Smoking and no pets allowed. Folly Farm, Oakwood, Heatherton, Manor Wildlife Park all within 20 minute drive. Additional Info: Children Freindly park, large grass area next to park, small outdoor heated pool (entertainment passes required) open May to end of August. We had a lovely family break here in this caravan. 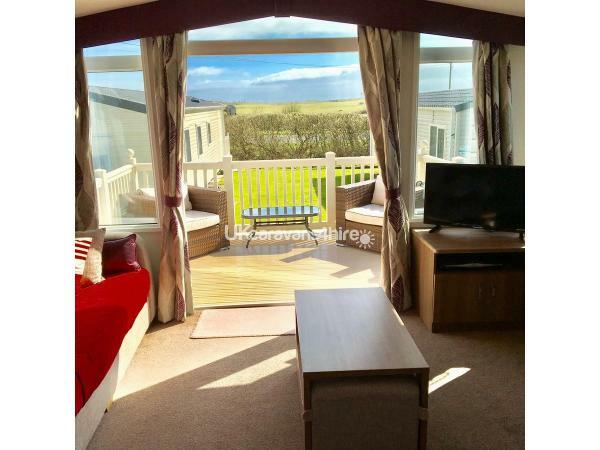 Excellent communication with Chris, easy to book..extremely good value, exceptionally clean with comfortable beds, seating areas, and great shower.. Free taxi service to kiln park... quick driving distance to the main town and nearby restaurants. Well worth a stay here, you won't be dissappointed. Thank you very much for such a wonderful review. Very easy booking with pleasant and attentive owners. 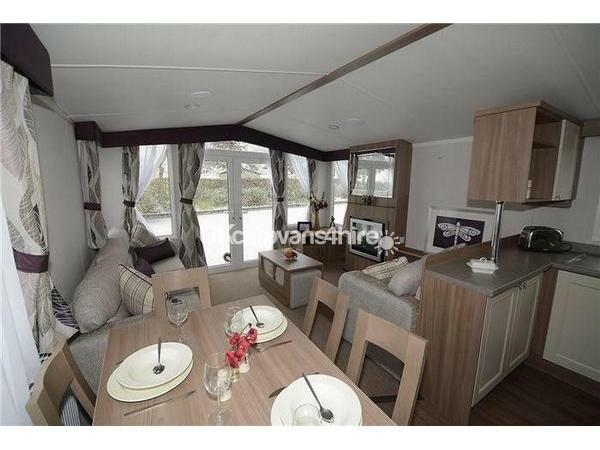 The caravan is to an exceptionally high standard and very comfortable. We thoroughly enjoyed our weeks stay, lovely beach close by, Cross Inn pub less than 5 min walk. Free taxi shuttle to Kiln Park which was a pleasant bonus. Thank you very much for this lovely review.